Welcome to Custom Garage Works! 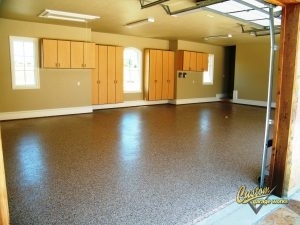 Recognized for our professional garage floor coating in Irving, TX, we first started our company in 2003. We decided to create the perfect garage for ourselves and our growing families, and when we couldn’t find what we were looking for within the existing industry, we decided to jump in ourselves. Now, we proudly offer professional garage storage solutions, along with top-of-the-line polyurea polyaspartic floor coatings, that have a much longer lifespan than epoxy. Our team of experts is committed to providing DFW with quality garage solutions and garage floor coating. 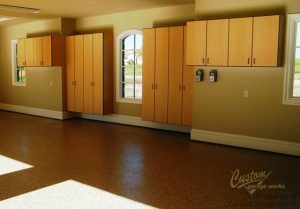 Among our most popular services is our polyurea polyaspartic floor coating in Irving, TX. This boom in popularity is probably because our coatings are stronger than epoxy, and cure faster, which means that you can drive in your garage within 24 hours in most cases. Thanks to it’s tough composition, our polyurea-based floor coating is resistant to changing color and failing that can occur with epoxy. Since we only use a diamond grinder to prepare the floor for coating, as opposed to acid etching, we can provide a higher quality end result. If you’re interested in hearing more about our garage floor coating service, you can schedule your free estimate when you call 214-494-9068 or 817-308-1305. And More! If you’d like to discover more about the services we provide, you can check them out here! As for storage, you’ll never have to wade through piles of clutter in your garage again when you choose a storage solution from Custom Garage Works. The greatest custom garages have an organization method in place. To meet the unique organizational needs of our clients, we offer a variety of different organization solutions, including overhead storage racks and cabinets. All of our Bulldog cabinets are secured to the wall for added safety, and our overhead storage racks are stronger and more reliable than the others you’ll find on the market. If you need a resilient garage floor coating in Irving, TX, and unmatched organization solutions, you can depend on Custom Garage Works. Storage Cabinets Unlike traditional cabinets, these are made specifically to let you get the most from your garage space! Car Lifts A residential garage car lift is easier to operate than you might think! And More! Do not be worried by clutter in your garage any more. We have the organization products you requires!